1. Six new Port Reviews have been added. 2. Following questions on Health Insurance from both Canadian and American readers, I have made some remarks below on this vital subject for cruisers. 3. Never mind pirates of the Caribbean! The Great Lakes can boast of its own pirate. 4. Updated information about water levels on each of the Great Lakes. (b). Bolles Harbor, MI (known then as Frenchtown) was the scene of intense and bloody fighting in the War of 1812. 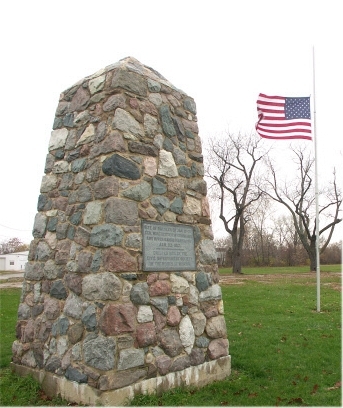 The Battle of Frenchtown is also called the Raisin River Massacre and today is the site of a National Battlefield park. Today, Bolles Harbor is a quiet harbor of refuge at the west end of Lake Erie. I am not a licensed insurance agent or broker. The following comments are designed to shed some light on the topic. They are presented strictly for informational and educational use only. Always, always confirm information with experts, licensed professionals or authorities. Information changes as legislation changes and companies alter products and policies. Several recent articles in the media have focused on the pitfalls found in most (all?) travel insurance policies. In each case, the travellers thought they were covered, only to discover that the insurance carrier refused to pay the claims based on some obscure technicality. In one case, a claim was denied because a traveller had mistakenly entered her trip cost as $1,090 vs the correct $1,092.50! Now I am not a cynic by any means, but when I hear the protestations of banks and insurance companies all assuring their clients that the client's welfare is their first and only concern, I could be forgiven for rolling my eyes. As an indication of the importance that you, the sailors who read this site, place on travel health insurance, it is the number 1 content page visited each month on Great Lakes Sailing. Month after month, thousands of readers visit that page – because it is an area of real concern. The areas that seem to cause the most grief for travellers are exclusions and limitations. Although you can use the insurance that comes with your credit card or purchase from an online agency or firm, I believe that the very best option is to deal with an independent insurance broker who has extensive experience or expertise in travel insurance. A broker will work with you to find the best product in the market place for your needs. a) Where is the insurance company located? You want a company regulated in Canada or the United States. b) See if you can get a waiver of pre-existing conditions – it will cost more but could eliminate the risk of claims being declined for pre-existing conditions. c) ANY 'promises' or 'guarantees' must be in writing. If an agent says ' x is covered', ask him/her to show you where. Believe me, if its not in writing, it simply doesn't exist. d) What costs will the insurer pay up front and which costs must you pay for yourself and then seek reimbursement. It can seem like a lot of work but when the decline rate for health insurance claims runs from 15% to 21%, it is well worth the time invested. 3. Pirates on the Great Lakes!! Dan Seavey was born in New England 1865. He grew up working on sailing vessels and by 1896 was recorded in Milwaukee, running a saloon. He also worked shipping goods, lumbering and working as a US Marshall. However, he also was involved in poaching, bootlegging and the prostitution business. His sail boat Wanderer often served as a travelling bordello. There are reports as well that he was involved in kidnapping women and bringing them south to sell into the prostitution trade in Chicago. 'Roaring Dan' as he was known was not a nice guy. He was a brawler, wife-beater, thief and had killed men. His most famous exploit was when in June 1908 he stole a schooner from the harbor of Grand Haven, MI. He sailed her southwest, across Lake Michigan, to Chicago to sell her cargo. The US government sent the steam-fired revenue cutter Tuscarora in pursuit. After several days of searching, Seavey was found on his own ship Wanderer. He was stopped, boarded and taken into custody. Interestingly, the court case proved inconclusive and Seavey was released. But Seavey was forever known afterwards as the pirate of Lake Michigan. Seavey lived until 1949, dying near Marinette, WI where he is buried. During May, there has been a significant rise in the water level of each of the Great Lakes. Lake Superior is up a 8in/20cm in the last month and 13in/33cm in the last year. In fact, Lake Superior is now a full 6in/15cm above its long-term average. Lake Michigan and Lake Huron are up 6in/15cm in the last month and 13in/33cm year-over-year. The level is now only 7in/18cm below the century average. Lake levels on both Lake Michigan and Lake Huron are now 23in/58cm above the lowest June lake level which was recorded in 1964. Lake St. Clair is up 5in/13cm in the last month and up 9in/23cm in the last year. Lake St. Clair is 1in/3cm above its long-term average. Lake Erie is up 4in/10 cm in the last month and 9in/23cm year-over-year. Lake Erie is 3in/8cm above the June century average. Lake Ontario is up 4in/10cm in the last month and 7in/18cm in the past year. Lake Ontario is 5in/13cm above the long-term average. This is all very good news for sailors.